Serve TACO BELL Cheesy Bean Dip Recipe with tortilla chips and watch it take over the party. 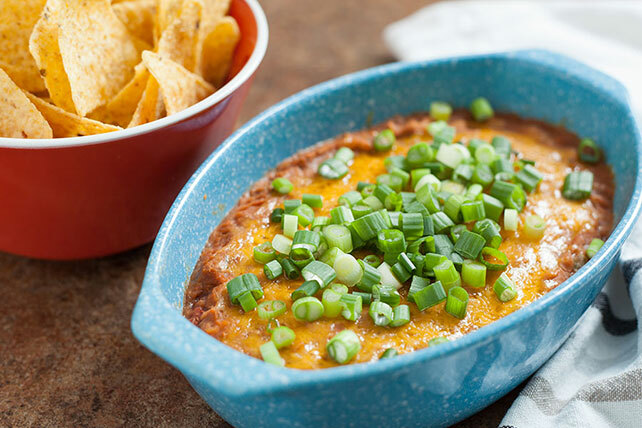 Warm and tasty, this cheesy bean dip recipe takes only 9 minutes. Mix beans, salsa and 1/2 cup of the cheese. Spread into 9-inch microwavable pie plate; top with remaining 1/2 cup cheese. Microwave on HIGH 3 to 4 minutes or until dip is heated through and cheese is melted. Sprinkle with onions. Serve with tortilla chips. Serve with warmed 6-inch flour tortillas as an appetizer or meatless entree. Makes 28 servings, 2 Tbsp. dip each.